We were in the path of Hurricane Irma and also witnessed other Hurricanes and storms that came thru the Tampa Bay Area. Many Floridians may decide to move now and it may become a buyers market where you can pick up an under priced home. Contact us at (727)399-1347 for full details and how a home inspection can determine the homes ability to withstand up to 120mph+ winds plus FEMA and flooding info. Homes with Hurricane straps, dimensional shingles, reinforced windows, tree limbs pruned etc. are Hurricane Prepared. If a home needs the updated protection we will negotiate it into any offers. Able to accommodate sailboats and motor boats. There are thousands waterfront homes, However, some are on pie shaped lots that are too narrow for a normal sized boat. Some are in narrow canals that are difficult to turn your boat around. Some canals have not been dredged in decades and are too shallow for sailboats or mid sized motor boats. Let us know your boat length and draft and we will research and email you real estate that will have the proper water depth and seawall to accommodate your motor boat or sailboat. A gem of a community with some of the best prices for waterfront homes can be found in New Port Richey. Residents can get a family membership for $144.00 a year and can walk, bike or drive to the community private beach. There is parking, covered picnic tables, bar'b'que grills and a rest room. There is also a clubhouse w/event center, pool and hot tub, tennis courts. Some of the canals are very deep with quick Gulf Access for fishing or fun. Some homes have a pool others may have room for one Cost for an in ground swimming pool from $25,000 and up. Understanding the difference between Flood Damage and Water Damage and how to protect your real estate. If you were considering a Waterfront Home and now have doubts after Hurricane Irma went thru Florida. Consider this. You can rent a boat anytime or we can find out if you can park your boat on a trailer in your driveway, side of home or garage for any homes that interest you. You can drive to the beach within minutes and buy a Florida Home that is inspected up to Hurricane codes and pay a lot less with a lot less stress. deep sailboat canal water and no bridges to get to the Gulf. Our experience will assist your search. Have a large sailboat or motor boat, want to know if you can dock it at a particular home? Just Ask Us. Don’t wait until you find a home to start thinking about how to finance it. Take time now to explore your options and decide what kind of mortgage loan is right for you. Having a pre-approval letter is much like having the cash. Some of the strongest offers are those with larger down payments. Unless buyers will be offering all cash, then a pre approval letter from a recognized lender is an absolute must. Sellers don't need to worry that if they accept your offer, you could be turned down for a loan. Also, with a pre-approval letter, you save the headache of viewing homes that are priced higher than your pre-approval. Sellers definitely prefer to negotiate with pre-approved buyers. Florida "The Sunshine State", became the third most populous state in the nation in July 2014 according to U.S. Census Bureau. There were an estimated 19,894,299 Floridians, compared to 19,746,256 people who called the State of New York home which had previously been third. California is first with 38.8 million residents, followed by Texas with 26.9 million residents. "Florida is on the way to become the number one destination for jobs, the best place to live, work and raise a family," Gov. Rick Scott said. Florida Real Estate Statistics shows that waterfront real estate is trending from a buyers market in what is referred to as "a sellers market." Florida's foreclosure rate is improving faster than in most other states. Florida foreclosure rates recently declined over 15 percent. Year to year it improved almost 25 percent. The foreclosure rate increased in 21 other states during the same time frame. Waterfront House For Sale in Florida. with Boat Lifts, Docks, Gulf Access. We specialize in Cheap Florida Waterfront Homes, Luxury Estates and Florida Gulf Front Beach Property. Florida Million Dollar Homes For Sale. Gulf Access Sail Boat Water Deep Canals Boating Real Estate in the 5 county Tampa Bay Area. Pinellas County, Pasco County, Hillsborough County, Sarasota and Manatee Counties. Find Property for sale in Palmetto, Terra Ceia, Bradenton, Anna Maria Island, Long Boat Key, Clearwater, Harbor Bluffs, Belleair Beach, Sand Key, Gulf Harbors, Tarpon Springs, Madeira Beach, Treasure Island, Redington, Indian Shores, Seminole, Safety Harbor. Celebrity Home, Tampa Bay Luxury Custom Estates and Houses. 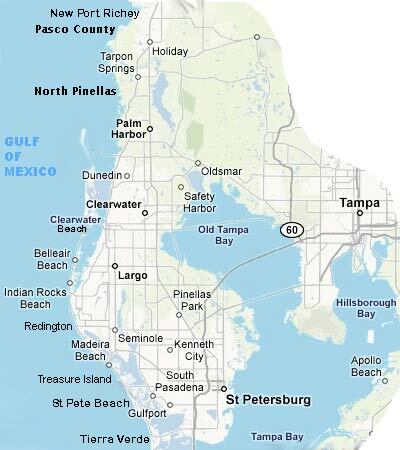 We also service Punta Gorda, Port Charlotte, Charlotte Harbor, Cape Coral, Sanibel, Fort Myers and North Fort Myers. We get asked this question a lot - What is the useful age of a tile roof? Concrete tile is typically warranted for at least 50 years, Ceramic clay tile on a roof is often warranted for 75 years. A NACHI Member blogged online that they can last 100 years depends on location (cold or hot climate) and the company if they installed to recommended specs. A home inspector easily can inspect an entire roof from a ladder without ever having to step foot on a tile roof. A cracked tile looks the same from a few feet away through binoculars as it does from standing of top of the roof. Evidence of a leak in the tile roof is usually found by internally inspecting the roof panels from inside in the attic. Nearly all home inspectors refuse to walk on tile roofs, and here is the reason why: When a home inspector walks on a tile roof that is believed to have no broken tiles and then reports that some broken tiles were observed, the inspector can then be blamed for breaking those tiles in the course of the inspection.